Imagine you’re in line at the local convenience store with whatever you’d normally buy there in your hand. A young person at the front of the line looks hesitant as they ask the clerk for a pack of smokes; overwhelmed by the different brands and sheer number of packages on the wall. After confirming they’re of age, the clerk says “here, these are what I use”, and off goes the kid. Personally, I’m not a smoker. With that said, a situation like this is not at all unfamiliar to me nor should it be to any who are reading this. 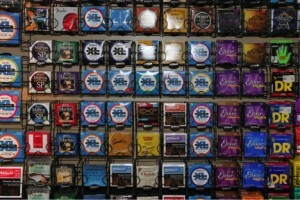 Remember the first time you had to buy a set of guitar strings? So, what string is best? Is there a superior brand? Are the fancy “coated” strings for 10 dollars more worth it? What gauge should we be using? What’s a “hybrid” pack? Can we replace just one string if we only broke one? These are all fair questions to ask. In this article I’ll answer each one, as well as address some tips for getting the best tone out of the strings you use. 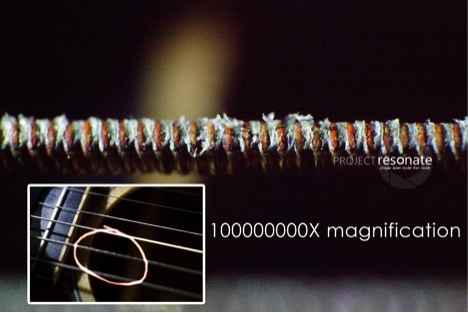 The thickness of your strings is measured in “‘thou”, or thousandths of an inch. To use the example I used above, a medium gauge 10 – 46 set of strings means that the thinnest string measures 0.010″ in diameter, while the thickest comes in at 0.046″. This set of strings as well as the “light” gauge 9 – 42 are the two most common sizes that brand new guitars are strung and set up with. It is for this reason that these are two sizes that many players stick with – the player is familiar with this size of string and not much work needs to be put into the guitar when it is restrung. 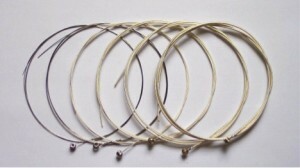 A lighter size string such as these are easier to manipulate, so fast playing and techniques such as bending require less effort. However, many would argue that a thinner string tends to sound…well… thinner when plucked compared to a larger one. Moving from a 10 – 46 set of strings to an 11 – 48 will certainly result in a noticeable difference in feel, and you may also find that your overall tone changes. That said, there are many fantastic guitar players who are living proof that you can get a HUGE sound from a small string – Billy Gibbons, Eddie Van Halen, and Jimmy Page, to name a few. There are packs available that combine thicker E, A, and D strings (to provide meatier sounding rhythm guitar) with thinner G, B and E strings to allow for easier play. If you plan on playing your guitar in a lower tuning, a thicker gauge string will make it so your strings remain tight enough to accommodate the lower pitch. 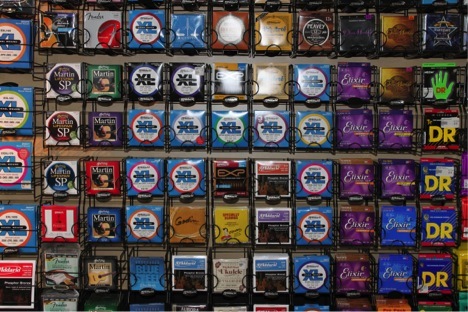 It may take a few re-strings before you find the size that suits you, but that’s part of the fun! PS – If you are converting to a different string gauge, always get your guitar a setup. The string tension will be different, and you will need to make changes to accommodate that. While acoustic guitars are typically strung with phosphor bronze, an electric guitar requires a metal that works better with the magnetic pickups. 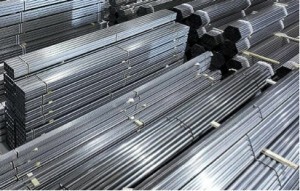 The majority of electric guitar strings are made of stainless steel, or are a steel core that is wound with nickel. While the steel strings tend to last longer, many players gravitate towards the nickel plated string for its softer touch and easier playability. Some brands take the process even further, offering strings that are coated in a polymer type material. Elixir strings are a notable example. This addition can prolong the life of the string, and make it a lot smoother to the touch. These ones tend to cost more than their uncoated counterpart, but the argument is that you won’t need to replace them as soon. I personally prefer the uncoated steel or nickel, but again, this is something you’ll have to test out and see what you like! Strings sound different when worn-in as opposed to just being put on. It really is a preference thing, though. I prefer a string that is almost new, while many prefer one that has a week of play in it. 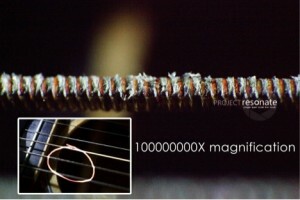 Either way, this is why I always prefer to restring the whole guitar when you snap a string. One brand new string with 5 old ones will stick out like a sore thumb both in looks, and the way it sounds. 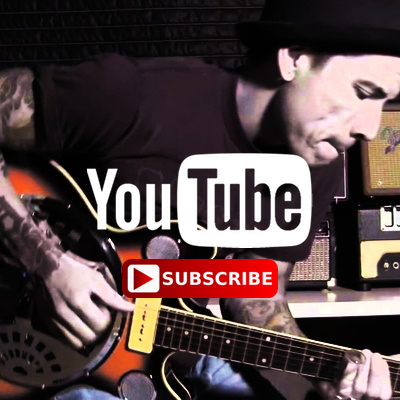 The amount of time to go before changing your strings depends on the player, and how much you play. Some professional musicians get a fresh restring every gig! I tend to go about a month before doing a restring on a guitar I play often. If a string sounds dead or muffled, check to see if it’s dirty. Dirt can collect in the grooves between windings and cause the string to not vibrate properly. Even a tiny piece of fluff on the string will affect its output and resonance. Check for dents in your strings before putting them on. If not stored properly, a string can develop a bend in it. Sometimes it will disappear when under tension, sometimes it stays which will alter the vibration of the string. If the notch in the string is located above a fret, it can cause fret buzz. All in all, don’t be intimidated by the sheer number of strings available. Find one that works for you, or have a different style for another guitar you own. 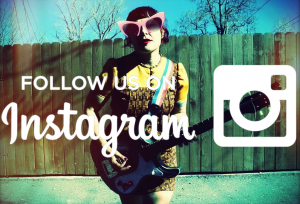 Try things out, and see how they change your tone and playability!